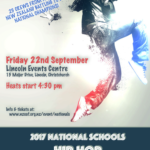 Our judges are trained dancers and choreographers who work and/or compete across New Zealand and internationally. Our national Head Judge, Tanya Houpt is an international Judge for FISAF International and Hip Hop Unite. Our Rules and Judging criteria are based off international standards and are regularly reviewed to make sure they stay relevant and ever evolving. We welcome feedback from teachers and crews and base any changes we make on the needs of our competitors, teachers and crew managers. from St Hilda’s Collegiate School.